I was looking through my Facebook pictures and decided I should share this favorite outfit from Summer 2009 for What I Wore Wednesday. 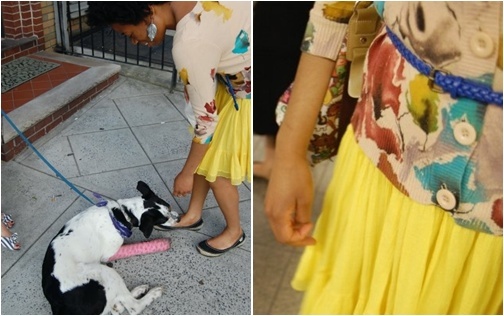 These photos were taken on July 4th in Greenpoint, Brooklyn by my dear friend Esty. They remind me of when she and I used to hang out all the time. When Esty took a million pictures. When summer days felt infinite as we went from dinner party to house party to dance party and made friends, sometimes furry, along the way. I can't believe that was just four years ago. It feels like ten million. People always talk about how time flies but I feel like my personal time moves slowly, and more so as I age. One day often feels like a week, in a totally awesome, abundant way. Maybe that's just how summer is. Olivia, been reading your blog for a bit. I love it. 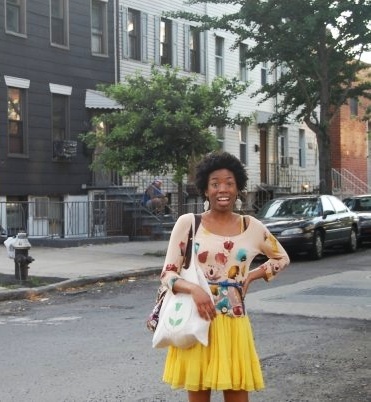 Your green, vegan and health tips are the best...plus adorable style. Thanks for your blog! Oh Mary <3 thank you SO MUCH! It's really encouraging to know that people are really reading and enjoying this. You made my day much brighter. I hope you're having a bright day too. Hugs! The colors in this outfit are the PERFECT colors for transitioning from summer to fall :) LOVING it! Time moves crazy fast. I can't believe how quickly a year passes these days. Better enjoy each day while it lasts! :) And that outfit looks very much like "you" to me!